I regularly help out with Astronomy in the City here at the University. Our most recent event was a Christmas special, and we gave a talk on 12 festive highlights covering events past, present and future, somewhat biased towards our research interests. Here is our count-down again. Isaac Newton, arguably the greatest physicist of all time, was born on 25 December 1642. I expect he may have got many joint birthday–Christmas presents. Newton is most famous for his theory of gravity, which he allegedly thought up after being hit on the head by a falling apple. Realising that the same force could be responsible for mundane things like falling as for keeping celestial bodies such as the planets in their orbits, was a big leap (or fall?). Netwon’s theory of gravity is highly successful, it’s accurate enough to get us to the Moon (more on that later) and only breaks down for particularly strong gravitational fields. That’s when you need Einstein’s theory of general relativity. 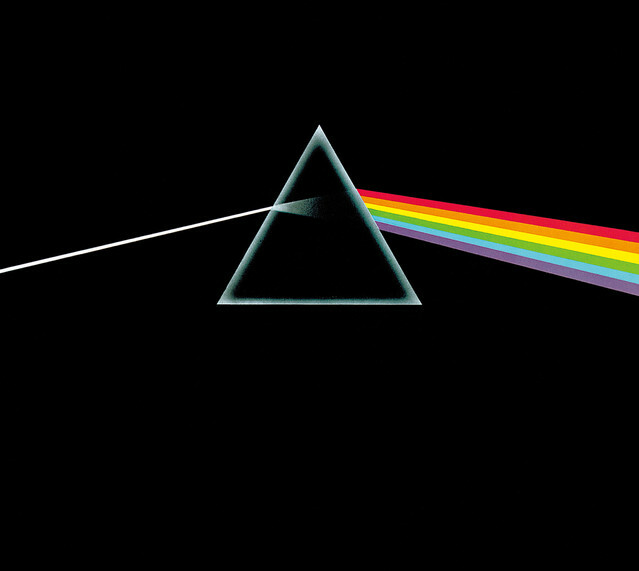 Newton may have been a Pink Floyd fan, we may never know. Newton also did much work on optics. He nearly blinded himself while prodding his eye to see how that would affect his sight. Even smart people do stupid things. Newton designed the first practical reflecting telescope. Modern astronomical telescopes are reflecting (using a mirror to focus light) rather than refracting (using a lens). The first telescope installed at the University’s Observatory was a Newtonian reflector. 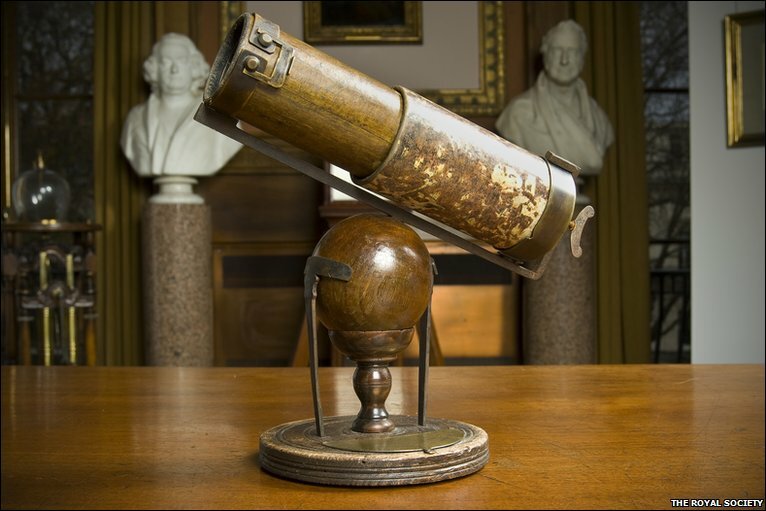 Newton’s reflecting telescope, one of the treasures of the Royal Society. Newton was President of the Royal Society, as well as Master of the Royal Mint, Member of Parliament for University of Cambridge and Lucasian Professor of Mathematics. It’s surprising he had any time for alchemy. At Astronomy in the City, we have talks on the night sky and topics in astrophysics, a question and answer session, plus some fun activities after to accompany tea and biscuits. There’s also the chance to visit the Observatory and (if it’s clear) use the Astronomical Society’s telescopes. Since the British weather is so cooperative, we only had two clear observing nights from this year’s events (prior to the December one, which was clear). If you had made one of the clear nights, you could have viewed the nebulae M78 and M42, or Neptune and its moons. Neptune, being one of the ice giants, is a good wintry subject for a Christmas talk. It’s pretty chilly, with the top of its atmosphere being −218 °C. You don’t have a white Christmas on Neptune though. It’s blue colouring is due to methane, which with ammonia (and good old water) makes up what astronomers call ices (I guess you should be suspicious of cocktails made by astronomers). One of the most exciting views of the year was supernova 2014J, back in January. This was first spotted by students at University College London (it was cloudy here at the time). 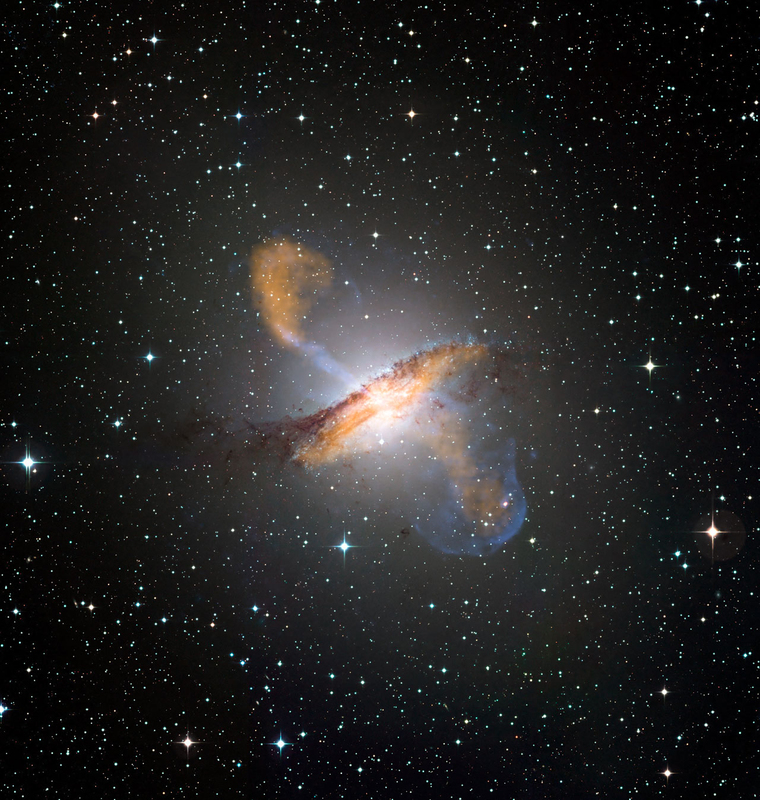 It’s located in nearby galaxy M82, and we got some pretty good views of it. You can see it out-shine its entire host galaxy. Supernovae are pretty bright! 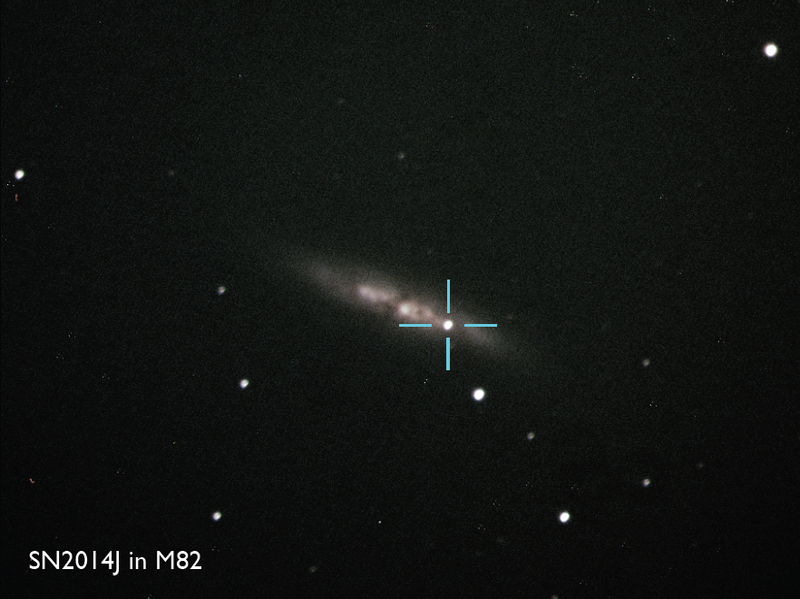 Supernova 2014J in M82. Image from the University of Birmingham Observatory. Galaxy clusters are big. They are the largest gravitationally-bound objects in the Universe. They are one of astrophysical objects that we’re particularly interested in here at Birmingham, so they’ll pop up a few times in this post. Galaxy clusters have three main components. Like trifles. Obviously there are the galaxies, which we can see because they are composed of stars. Around the galaxies there is lots of hot gas. This is tens of millions of degrees and we can spot it because it emits X-rays. Don’t put this in your trifles at home. The final component is dark matter, the mysterious custard of our trifle. We cannot directly see the dark matter (that’s why it’s dark), but we know its there because of the effects of its gravity. 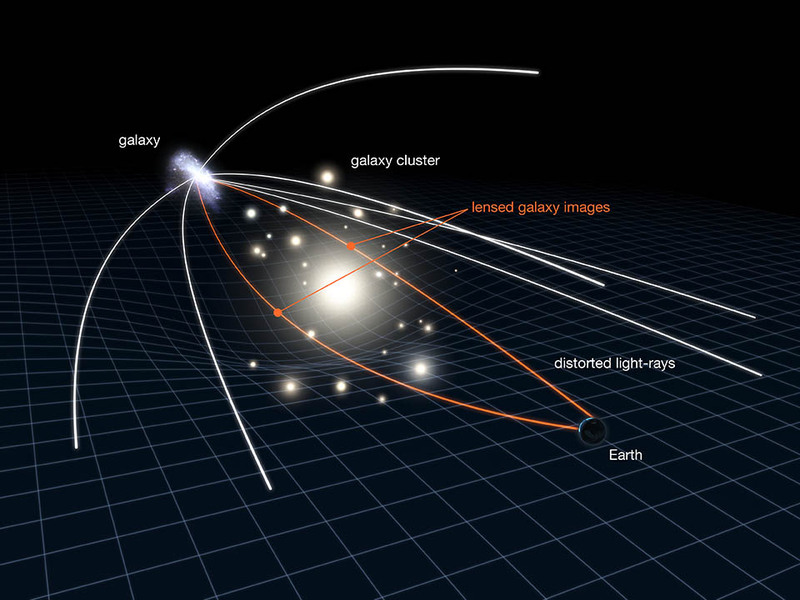 We can map out its location using gravitational lensing: the bending of light by gravity, one of the predictions of general relativity. Different views of cluster Abell 209. The bottom right is a familiar optical image. Above that is a smoothed map of infra-red luminosity (from old stars). The top left is a map of the total mass (mostly due to dark matter) as measured with gravitational lensing. 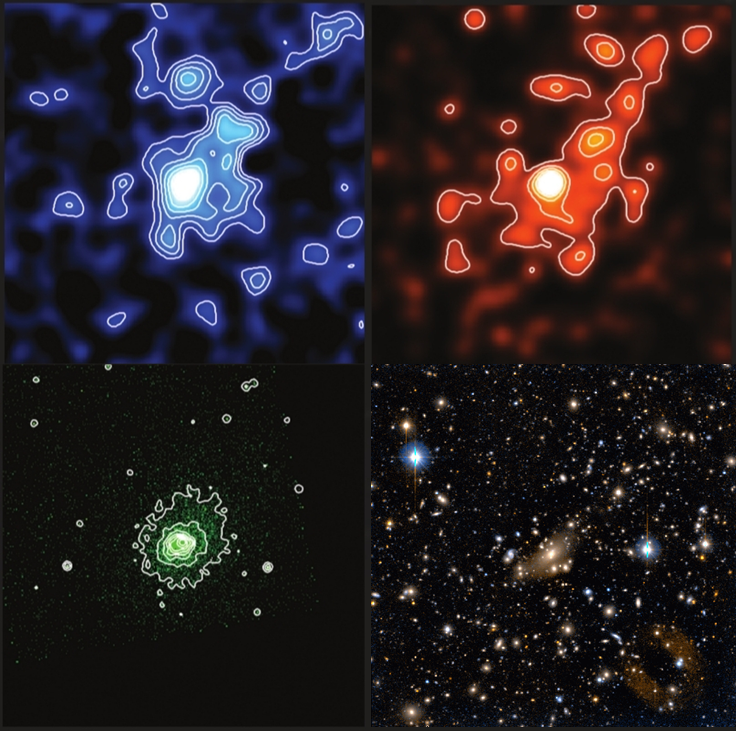 The bottom left is a X-ray map of the hot intergalactic gas. Credit: Subaru/UKIRT/Chandra/University of Birmingham/Nordic Optical Telescope/University of Hawaii. Measuring the dark matter is tricky, but some of the work done in Birmingham this year shows that is closely follows the infra-red emission. You can use the distribution of jelly in your trifle to estimate how much custard there should be. In the picture above of galaxy cluster Abell 209, you can see how similar the top two images are. Using the infra-red could be a handy way of estimating the amount of dark matter when you don’t have access to gravitational-lensing measurements. A highlight for next year: the first observing run of Advanced LIGO. 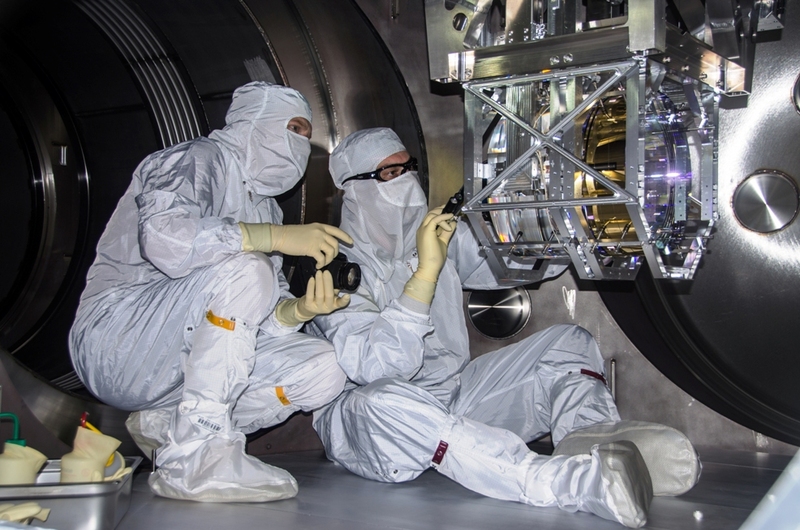 Advanced LIGO is trying to make the first direct detection of gravitational waves. Gravitational waves are tiny stretches and squeezes in spacetime, to detect them you need to very carefully measure the distance between two points. This is where the 4 km arms come in: the Advanced LIGO detectors bounce lasers up and down their arms to measure the distance between the mirrors at the ends. The arms need to be as long as possible to make measuring the change in length as easy as possible. A typical change in length may be one part in 1021 (that is 1,000,000,000,000,000,000,000 or one sextillion… ). For comparison, that’s the same as measuring the distance between the Earth and the Sun to the diameter of a hydrogen atom or the distance from here to Alpha Centuri to the width of a human hair. 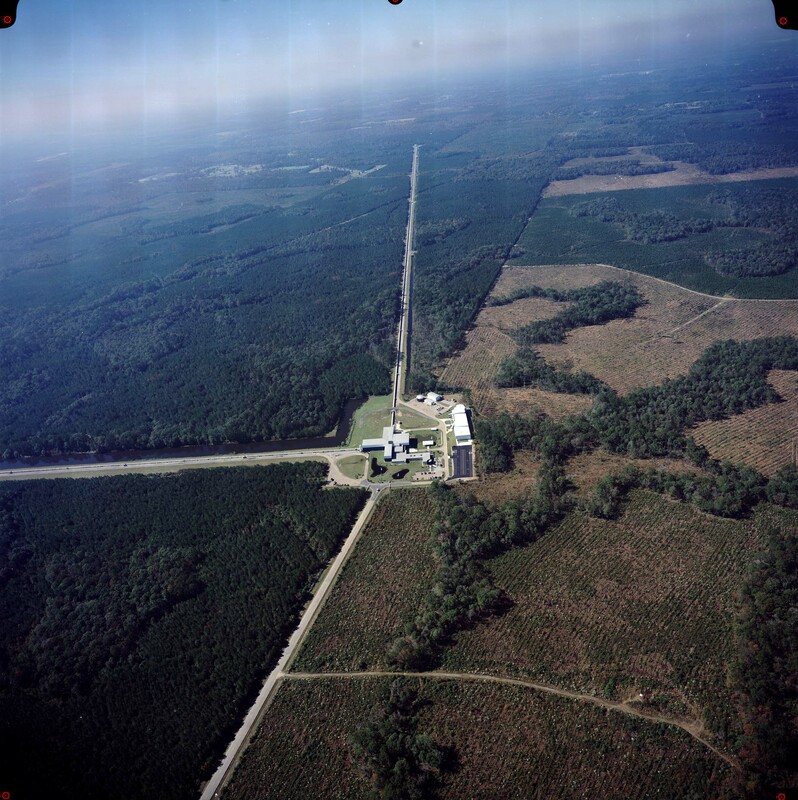 Aerial shot of LIGO Livingston, Louisiana. Two arms come out from the central building, one goes up the middle of the picture, the other goes off to the left out of shot. I think this gives a fair indication of the scale of the detectors. In addition to the instruments in Livingston, there is another LIGO in Hanford, Washington. Making such an precise instrument is tricky. At least twice as tricky as remembering the names of all seven of the dwarfs. We shouldn’t be Bashful about saying how difficult it is. We need to keep the mirrors extremely still, any little wibbles from earth tremors, nearby traffic, or passing clouds need to be filtered out. Lots of clever Docs have been working on cunning means of keeping the mirrors still and then precisely measuring their position with the lasers. Some of that work was done here in Birmingham, in particular some of the mirror suspension systems. We’ll be rather Grumpy if those don’t work. However, things seem to be going rather well. Getting the mirrors working isn’t as simple as pushing a big red button, so it takes a while. On the 3 December, which is when we gave this talk at Astronomy in the City, the second detector achieved its first full lock: lock is when the mirrors are correctly held stably in position. This made me Happy. Also rather Sleepy, as it was a late night. 5 (or more) planet-forming rings! One of the most exciting discoveries of 2014 is this remarkable image of a planet-forming disc.There may be more than five planets, but it seemed like a shame not to fit this into our countdown here. The image is of the star HL Tauri. This is a young star, only a million years old (our Sun is about 4.6 billion years old). 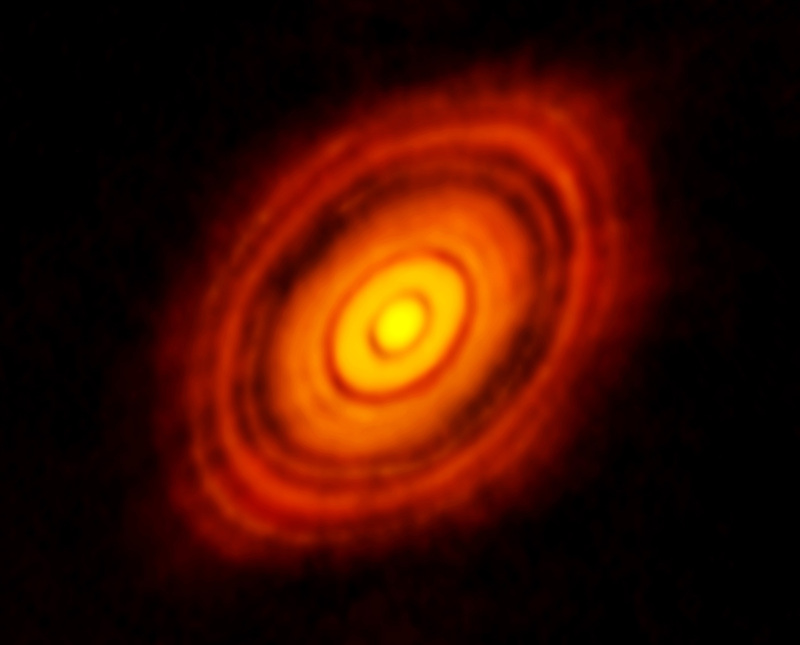 Remarkably, even at this young age, there seems to be indication of the formation of planets. The gaps are where planets have sucked up the dust, gas and loose change of the disc. This is the first time we’ve seen planet-formation in such detail, and matches predictions extremely well. The six Frontier Fields are a group of six galaxy clusters that are being studied in unprecedented detail. They are being observing with three of NASA’s great observatories, the Hubble Space Telescope, the Spitzer Space Telescope (which observes in the infra-red) and the Chandra X-ray Observatory. These should allow us to measure all three components of the clusters (even the custard of the trifle). The clusters are all selected because the show strong gravitational lensing. This should give us excellent measurements of the mass of the clusters, and hence the distribution of dark matter. Gravitational lensing by a galaxy cluster. 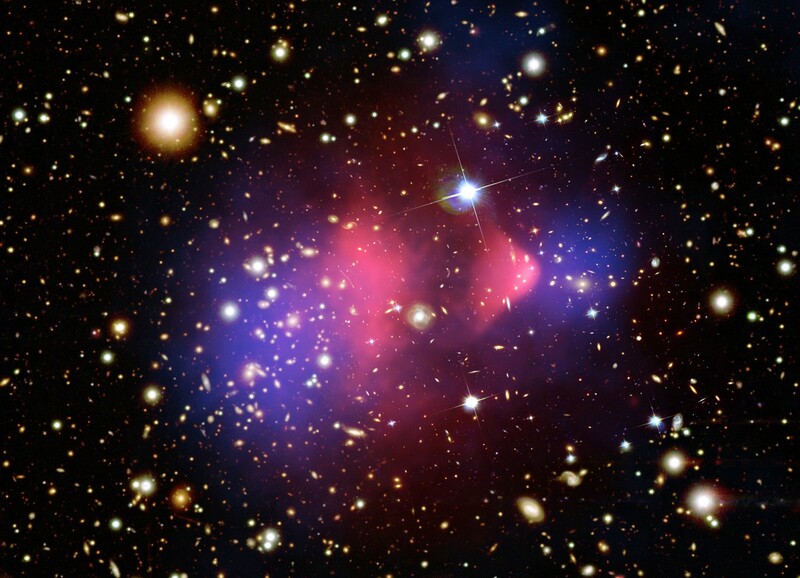 The mass of the galaxy cluster bends spacetime. Light travelling through this curved spacetime is bent, just like passing through a lens. The amount of bending depends upon the mass, so we can weigh galaxy clusters by measuring the lensing. Credit: NASA, ESA & L. Calcada. New Horizons is a planetary mission to Pluto (and beyond). 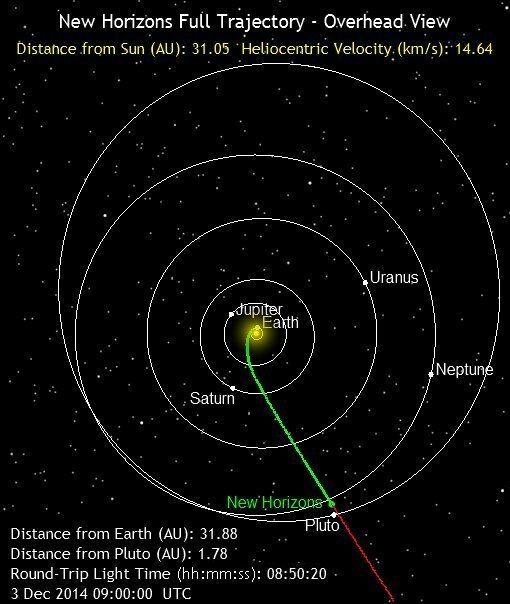 Launched in January 2006, New Horizons has been travelling through the Solar System ever since. In 2007 it made a fly-by of Jupiter, taking some amazing pictures. It is now just 7 months from reaching Pluto. This will give us the first ever detailed look at Pluto and its moons. You’ll need to wrap up warm if you wanted to head there yourself. I hope that New Horizons packed some mittens. New Horizons will tell us about Pluto and other icy (yes, that’s astronomers’ definition of ice again) items in the Kuiper belt. New Horizons has been in hibernation for much of its flight. Who doesn’t like a good nap? New Horizons was woken up ahead of arriving at Pluto on 7 December. It got a special wake-up call from Russell Watson. I don’t think it has access to coffee though. 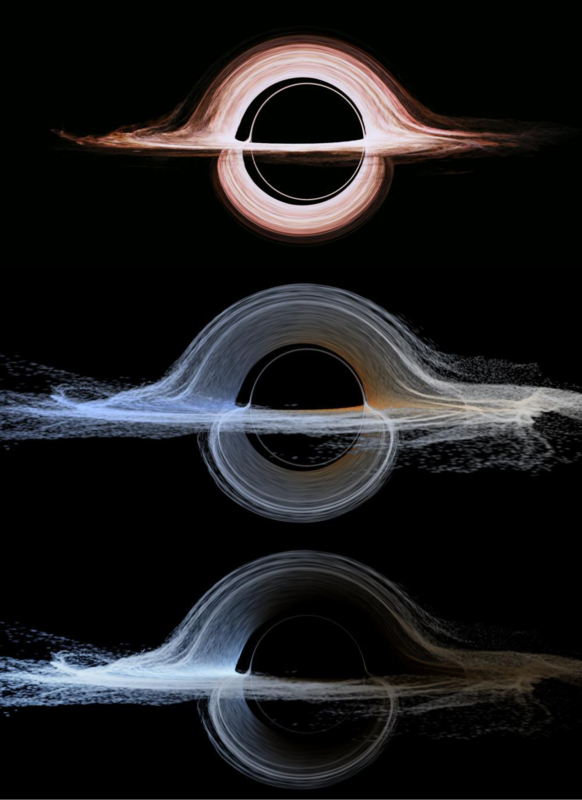 This year’s Interstellar featured the most detailed simulations of the appearance of black holes. This involved a truly astounding amount of data. I’ve previously written about some of the science in Interstellar. I think it’s done a good at getting people interested in the topic of gravity. It’s scientific accuracy can be traced to the involvement of Kip Thorne, who has written a book on the film’s science (which might be a good Christmas present). Kip has done many things during his career, including being one of the pioneers of LIGO. After an exciting 2014 with the release of Interstellar, I’m sure he’s looking forward to 2015 and the first observations of Advanced LIGO too. 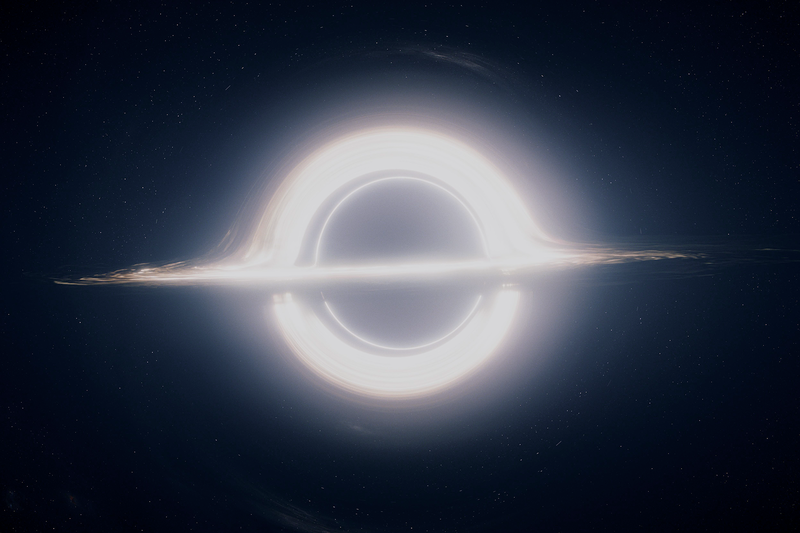 Light-bending around the black hole Gargantua in Interstellar. This shows the accretion disc about the black hole, the disc seen above and below the hole are actually the top and bottom of the disc behind the black hole. This extreme light-bending is a consequence of the extremely curved spacetime close to the black hole. This light-bending is exactly the same as the gravitational-lensing done by galaxy clusters, except much stronger! When we gave the talk on 3 December, Kepler had discovered 998 exoplanets. It’s now 999, which I think means we get all the bonus points! Kepler is still doing good science, despite some technical difficulties. Kepler has been hugely successful. We now know that planets (as well as forming in quite short times) are common, that they are pretty much everywhere. Possibly even down the back of the sofa. Some of the work done here in Birmingham has been to estimate just how common planets are. On average, stars similar to the Sun have around 4 planets with periods shorter than 3 years (and radii bigger than 20% of Earth’s). That’s quite a few planets! But, if Christopher Nolan wants to direct another reasonably accurate sci-fi, we need to know how many of those are Earth-like. We don’t have enough data to work out details of atmospheres, but just looking at how many planets have a radius and period about the same as Earth’s, it seems that about 4% of these stars have Earth-like planets. 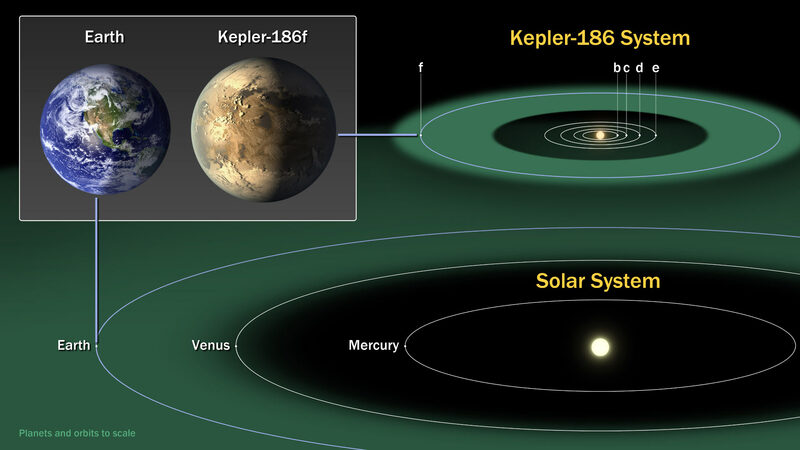 Kepler-186, the first system discovered with an Earth-sized planet on the edge of the habitable zone (where liquid water could exist), was discovered in 2014. A Christmas highlight from 1968. On December 21, Apollo 8 launched. This was the first manned mission to ever leave Earth orbit. On Christmas Eve, it entered into orbit about the Moon. It’s three-man crew of Frank Borman, James Lovell and William Anders were the first people ever to orbit a body other than the Earth. To date, only 24 men have ever done so. Of course, even fewer have actually walked on the Moon, perhaps we should go back? Jim Lovell was also on the ill-fated Apollo 13 mission (you may have seen the film), making him the only person to orbit the Moon on two separate occasions and never land. Apollo 8 was successful, it orbited the Moon 10 times, giving us the first ever peek at the dark side of the moon (not the Pink Floyd album). 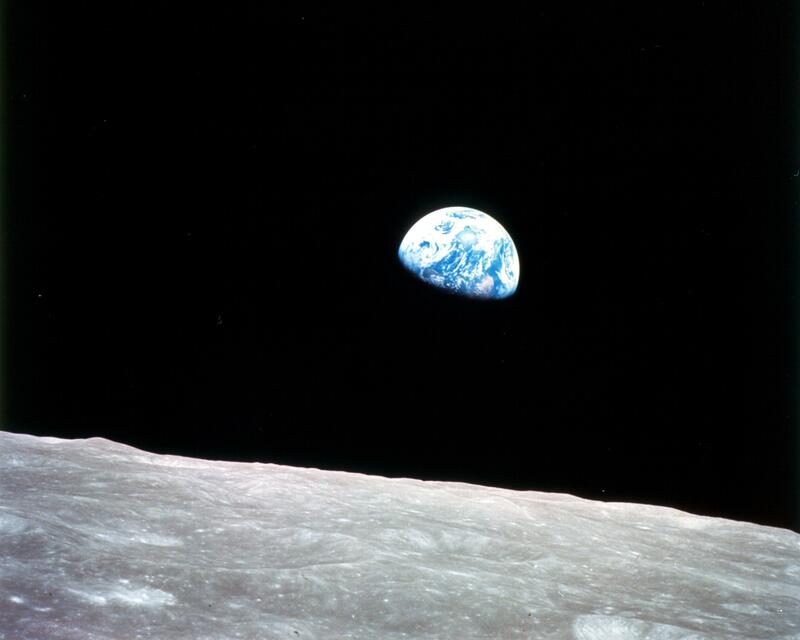 This was also the first viewing of an Earthrise. Their Christmas Eve broadcast was most watched TV broadcast at the time. After orbiting, Apollo 8 returned home, splashing down December 27. I’m guessing they had a good New Year’s celebration! This year we landed on a comet. Rosetta has received fair amount of press. It is an amazing feat, Rosetta was in space for almost 11 years before making its comet rendezvous. It’ll be doing lots of science form orbit, such as determining that comets are unlikely to have delivered water to Earth. Most of the excitement surrounded the landing of Philae on the surface of the comet. That didn’t go quite as planned, but still taught us quite a bit. 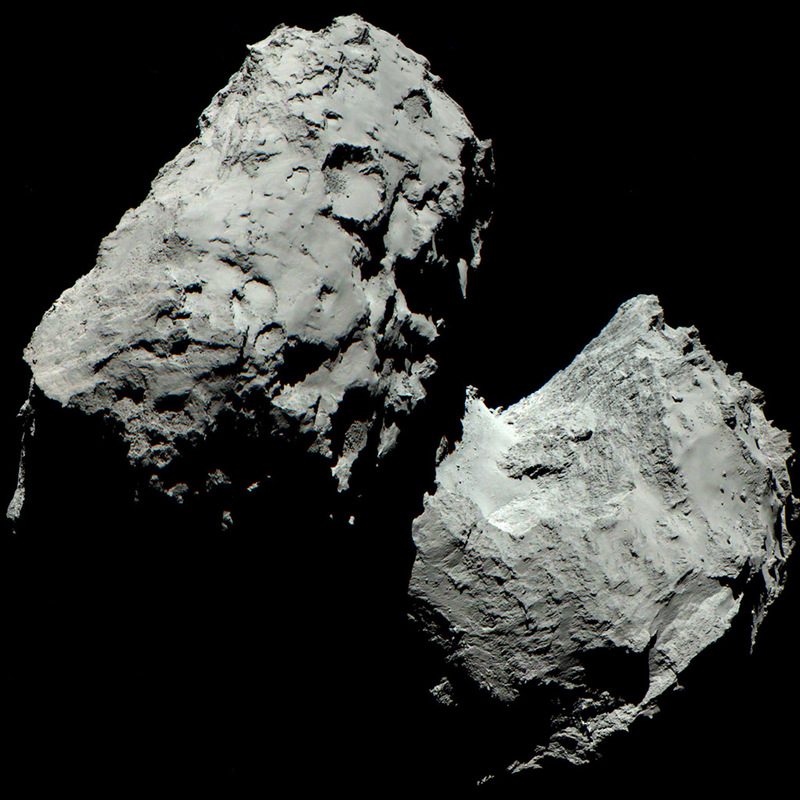 Rosetta has been heralded as one of the science breakthroughs of 2014. We’ll have to see what 2015 brings. To finish up, back to galaxy clusters. Galaxy clusters grow by merging. We throw two trifles together to get a bigger one. As you might imagine, if you throw two triffles together, you don’t get a nice, neat trifle. The layers do tend to mix. For galaxy clusters, you can get layers separating out: dark matter passes freely through everything, so it isn’t affected by a collision. The gas, however, does feel the shock and ends up a turbulent mess. It has been suggested that turbulence caused by mergers could trigger star formation: you squeeze the gas and some of it collapses down into stars. However, recent observational work at Birmingham can’t find any evidence for this. We’ll have to see if this riddle gets unravelled in 2015. Planet and accretion disc orbiting Gargantua, the black hole in Interstellar. Visual effects produced by the cunning people of Double Negative. Interstellar is the latest film from Christopher Nolan. 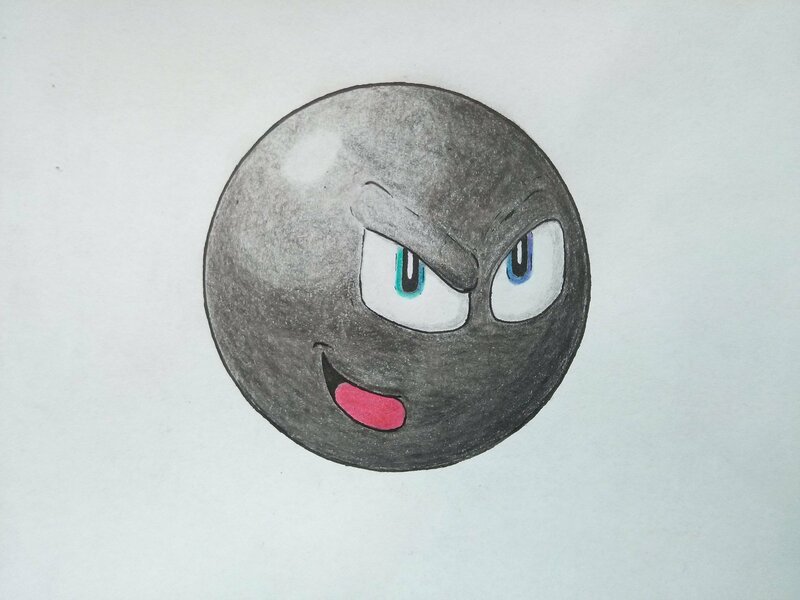 After completing his work with the Dark Knight, it seems he has moved onto even darker material: black holes. I have been looking forward to the film for some time, but not because of Nolan’s involvement (even though I have enjoyed his previous work). The film is based upon the ideas of Kip Thorne, an eminent theoretical physicist. Kip literally wrote the book on general relativity. He was a pioneer of gravitational-wave science, and earlier versions of the script included the detection of gravitational waves (I’m sad that this has been removed). Here, I’ll briefly discuss the film, before going on to look at it’s science (there are some minor spoilers). 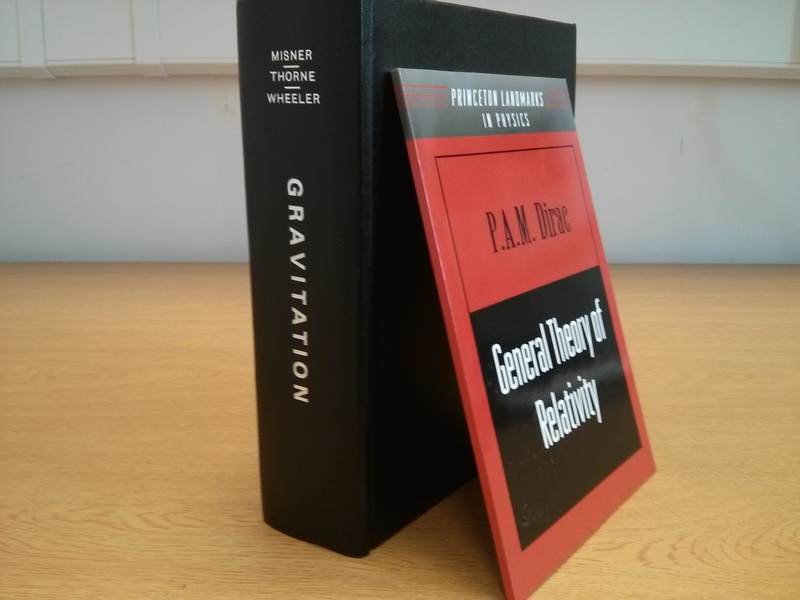 My copies of Gravitation by Misner, Thorne & Wheeler, and General Theory of Relativity by Dirac. The difference in length might tell you something about the authors. MTW (as Gravitation is often called) is a useful textbook. It is so heavy that you can actually use it for experiments testing gravity. Last week, my research group organised a meeting for our LIGO collaborators. We all got together in Birmingham to work on how we analyse gravitational-wave data. It was actually rather productive. We decided to celebrate the end of our meeting with a trip to see Interstellar. The consensus was that it was good. We were rather pleased by the amount of science in the film, undoubtedly due to Kip’s involvement (even if he doesn’t approve of everything)—we also liked how there was a robot called KIPP. My favourite characters were, by far, the robots. They had more personality than any of the other characters: I was more concerned for their survival than for anyone else. (No-one was wearing red, but I thought it was quite obvious who was expendable). Michael Caine’s character is apparently based upon Kip—they do have similar beards. The film is beautiful. Its visualisations have been much hyped (we’ll discuss these later). It shows an obvious debt to Kubrick’s 2001: A Space Odyssey. This is both for better and worse: mimicking the wonderful cinematography and the slow pacing. However, the conclusion lacks the mystery of 2001 or even the intelligence of Nolan’s earlier work Memento or Inception (both of which I would highly recommend). I don’t want to say too much about the plot. I (unsurprisingly) approve of its pro-science perspective. There were some plot points that irked me. In particular, why on Earth (or off Earth) would a mission with the aim of continuing the human race only take one woman? Had no-one heard about putting all your eggs in one basket? Also, using Morse code to transmit complicated scientific data seems like a bad idea™. What if there were a typo? However, I did enjoy the action sequences and the few tense moments. I expect that if you were after a proper film critique you’d be reading something else, so let’s discuss science. There is a lot of science in Interstellar, and I can’t go through it all, so I want to highlight a couple of pieces that I think are really cool. where is the black hole’s mass, is Newton’s gravitational constant, is the speed of light, and measures how far you are from (the centre of) the black hole (more on this in a moment). If you were to flash a light every , your friend at infinity would see them separated by time ; it would be as if you were doing things in slow motion. You might recognise as the location of the event horizon: the point of no return from a black hole. At the event horizon, we would be dividing by zero in the equation above, time would appear to run infinitely slowly for you. This is rather curious, time continues to run fine for you, but watching from infinity you would fade to a complete stand-still. Actually, you would also fade from view too. The frequency of light gets shifted by gravity. Light is a wave, it’s frequency is set by how fast it completes one cycle. The period of the wave gets stretched using the formula above. As you get closer to a black hole, light from you becomes more red (then infra-red, radio, etc. ), and also becomes dimmer (as less energy arrives at your friend at infinity in a given time). You appear to fade to to black as you approach the event horizon. This stretching of light to lower frequencies is known as red-shifting (as red light has the lowest frequencies of the visible spectrum). I didn’t see much sign of it in Interstellar (we’ll see the effect it should have had below), although it has appeared in an episode of Stargate: SG-1 as a plot device. The event horizon is also the point where the force on the string would become infinite. Your friend at infinity would only be able to pull you back up if they ate an infinite amount of spinach, and sadly there is not enough balsamic dressing to go around. A technicality that is often brushed over is what the distance actually measures. I said it tells you how how you are from the centre of the black hole, but it’s not as simple as dropping a tape measure in the see where the singularity is. In fact, we measure the distance differently. We instead measure the distance around the circumference of a circle, and divide this by to calculate . The further away we are, the bigger the circle, and so the larger . If space were flat, this distance would be exactly the same as the distance to the middle, but when considering a black hole, we do not have flat space! If it were to travel closer and closer to the speed of light, the passage of time for it would slow to closer and closer to a standstill. This is just like crossing the event horizon. In Interstellar, there is a planet where each hour corresponds the seven years at a distance. That is a difference of about 61000. We can get this with our formula if . Sadly, you can’t have a stable orbit inside , so there wouldn’t be a planet there. However, the film does say that the black hole is spinning. This does change things (you can orbit closer in), so it should work out. I’ve not done the calculations, but I might give it a go in the future. 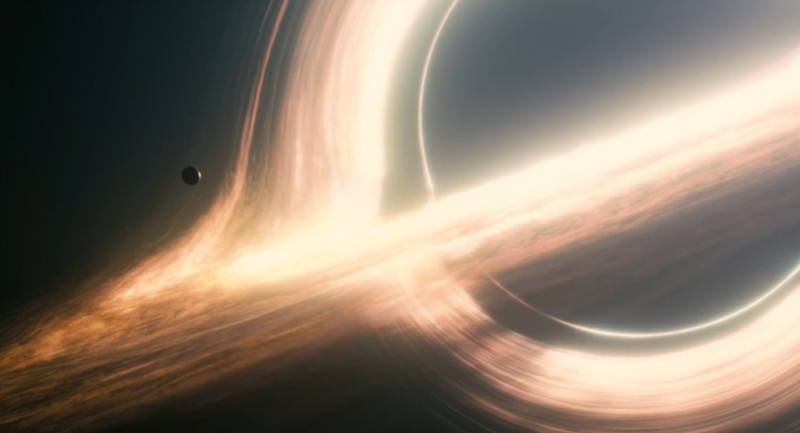 Interstellar does an excellent job of representing a black hole. Black holes are difficult to visualise, but the film correctly depicts them as three-dimensional: they are not a two-dimensional hole. As nothing escapes from a black hole (and they don’t have a surface), they are dark, a shadow on the sky. However, we can see their effects. The image at the top shows a disc about the black hole. Material falling into a black hole often has some angular momentum: it doesn’t fall straight in, but goes off to the side and swirls about, exactly as water whirls around the plug-hole before falling in. This material swirling around is known as an accretion disc. In the disc, things closer to the black hole are orbiting faster (just as planets closer to the Sun orbit faster than those further away). Hence different parts of the disc rub against each other. This slows the inner layers (making them lose angular momentum so that they move inwards), and also heats the disc. Try rubbing your hands together for a few seconds, they soon warm up. In an accretion disc about a black hole, things can become so hot (millions of degrees) that they emits X-rays. You wouldn’t want to get close because of this radiation! Looking for these X-rays is one way of spotting black holes. The video below shows a simulation from NASA of an accretion disc about a black hole. It’s not quite as fancy as the Interstellar one, but it’s pretty cool. You can see the X-rays being red-shifted and blue-shifted (the opposite of red-shifted, when radiation gets squashed to higher frequencies) as a consequence of their orbital motion (the Doppler effect), but I’m not sure if it shows gravitational red-shifting. Black holes bend spacetime, so light gets bent as it travels close to them. The video above shows this. You can see the light ring towards the centre, from light that has wrapped around the black hole. You can also see this in Interstellar. I especially like how the ring is offset to one side. This is exactly what you should expect for a rotating black hole: you can get closer in when you’re moving with the rotation of the black hole, getting swept around like a plastic duck around a whirlpool. You can also see how the disc appears bent as light from the back of the disc (which has to travel around the black hole) gets curved. Light-bending around a black hole. This is figure 15 from James, von Tunzelmann, Franklin & Thorne (2015). The top image shows an accretion disc as seen in Interstellar, but without the lens flare. The middle image also includes (Doppler and gravitational) red-shifting that changes the colour of the light. To make the colour changes clear, the brightness has been artificially kept constant. The bottom image also includes the changes in brightness that would come with red-shifting. The left side of the disc is moving towards us, so it is brighter and blue-shifted, the right side is moving away so it is red-shifted. You can see (or rather can’t) how red-shifting causes things to fade from view. This is what the black hole and accretion disc would actually look like, but it was thought too confusing for the actual film. It’s not only light from the disc that gets distorted, but light from stars (and galaxies) behind the black hole. This is known as gravitational lensing. This is one way of spotting black holes without accretion discs: you watch a field of stars and if a black hole passes in front of one, it’s gravitational lensing will magnify the star. Spotting that change tells you something has passed between you and the star, working our its mass and size can tell you if it’s a black hole. Looking at the shadow of a black hole (the region from which there is no light, which is surrounded by the innermost light ring) can tell you about the structure of spacetime close to the black hole. This could give you an idea of its mass and spin, or maybe even test if it matches the predictions of general relativity. We are hoping to do this for the massive black hole at the centre of our Galaxy. This will be done using the Event Horizon Telescope, an exciting project to use several telescopes together to make extremely accurate images. 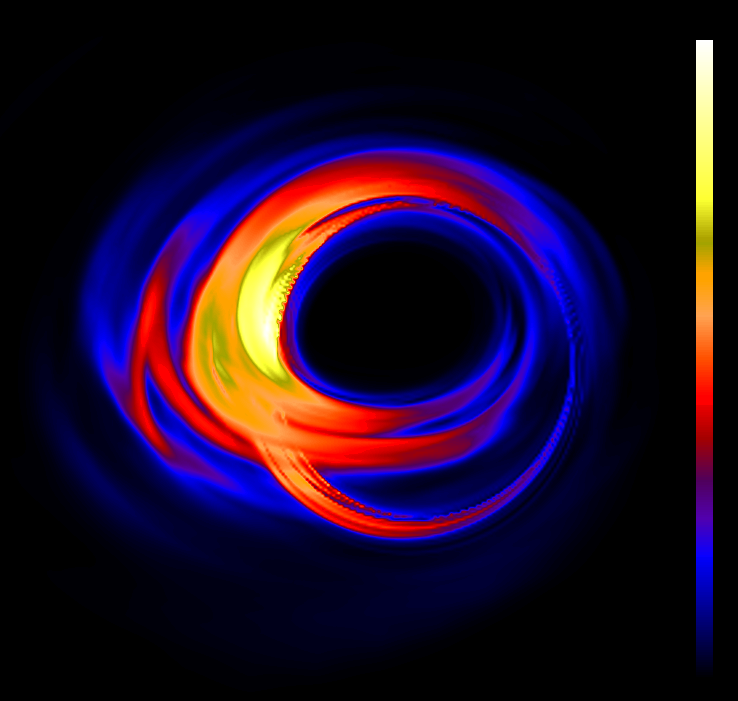 False-colour image of what the Event Horizon Telescope could see when look at Sagittarius A* (Dexter et al. 2010). Red-shifting makes some part of the the disc appear brighter and other parts dimmer. Interstellar is science fiction, it contains many elements of fantasy. However, it does much better than most on getting the details of the physics correct. I hope that it will inspire many to investigate the fact behind the fiction (there’s now a paper out in Classical & Quantum Gravity about the visualisation of the black hole, it comes with some interesting videos). If you’ve not seen the film yet, it’s worth a watch. I wonder if they could put the gravitational waves back in for an extended DVD version? Score out of 5 solar masses: enough for a neutron star, possibly not enough for a black hole.